I like the idea of a SLS free shampoo, but the ones I've tried in the past have left my hair feeling stripped and dry or they didn't lather up at all, however I'm pleased to say this Akin one (which I was sent from myPure) ticks all the boxes for a good shampoo! 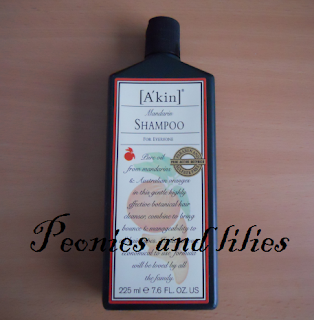 Like all A'kin products, it comes in a recyclable plastic bottle with a vintage looking label and it has a definite smell of oranges, although its more of an herbal orange smell rather than a citrus one. 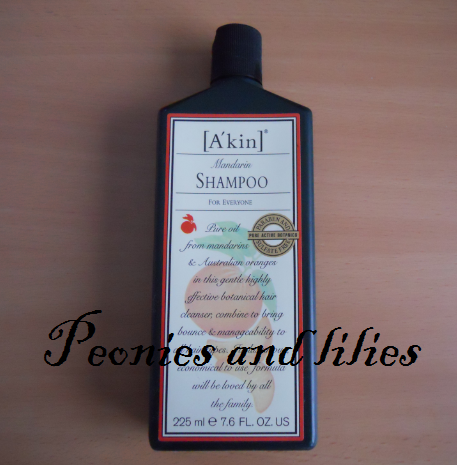 I didn't have any problems getting this shampoo to lather up, and it rinsed away easily without leaving any residue. The shampoo left my hair feeling squeaky clean but not at all stripped or dry and afterwards my hair was as silky and shiny as normal. Since I've started using this, my scalp gets a lot less itchy and irritated (and I'm hoping with continued use, it'll go away altogether), and because it doesn't coat my hair like other shampoos, I can get away with washing it less often, so all in all, a definite thumbs up from me! Do you actively avoid SLS products? What are your favourite SLS free shampoos?